As far as blood and guts go, Overlord is a pleasant surprise. Depending on one’s point of view, the timing of this theatrical release is either a hit or a miss. Halloween’s already in the rearview mirror; on the other hand, this is Veterans Day weekend. At first blush, a zombie movie set during World War II doesn’t seem like much of a salute to America’s veterans. But there’s cleverness here that blends the very real horrors of war, known facts about Nazi experiments on human prisoners and the fantastical elements of zombie terror. Consider this one as pulp horror. And it works rather well. The story by Billy Ray (State of Play) and Mark L. Smith (The Revenant) wastes no time in setting the stage. It’s June 6, 1944. The Normandy invasion is imminent. But there’s a problem. A troop of U.S. soldiers need to knock out a Nazi communications tower in a small French village in order for the Allied forces to successfully stage their landing. Making an already dangerous mission all the more challenging, the village citizens are held captive by the Nazis and are subjected to all sorts of heinous experiments. What goes on inside that historic French church is far more evil than anything in Resident Evil. Overlord is equal parts war movie and horror movie — and it’s also a loving tribute to movies as a whole. A black-and-white Paramount logo segues to an old-school title card, the kind with the copyright notice right below the title. It most certainly sets the mood for what follows: a sort of Raiders of the Lost Ark meets Dawn of the Dead by way of Castle Wolfenstein, all served up as entertaining — and horrifying — pulp fiction. Unlike the recent rote reboot of Michael Meyers in the latest Halloween, this is the way to reinvigorate a genre. And it feels a lot like an extension of the Cloverfield series, which isn’t all that surprising given J.J. Abrams is a producer. Fittingly, the handful of U.S. soldiers who survive a harrowing air attack (a war horror all its own) arrive at the village in the dead of night. It’s a time when everything takes on an ominous vibe. And it doesn’t help to have Nazis on the prowl and nosy neighbors calling out curfew violations. 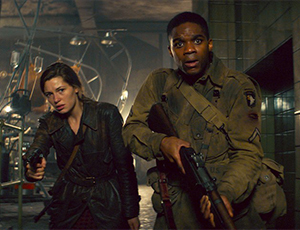 Part of the fun of Overlord (and, yes, Overlord is a fun horror movie) is the cast is largely built around up-and-comers; some of the faces are familiar more so on TV screens than big screens. The two lead U.S. soldiers trying to keep the small band of brothers together are Boyce (Jovan Adepo, Tom Clancy’s Jack Ryan on Amazon Prime) and Ford (Wyatt Russell, Ingrid Goes West). They’re quick to align forces with a French spy, Chloe (Mathilde Ollivier, The Misfortunes of Francois Jane). Ollivier is the least familiar of the lead cast members and she’s certainly one to watch for going forward. Ditto for director Julius Avery (Son of a Gun). This is only his second feature, but he’s already attached to direct a Flash Gordon reboot. The chills and thrills escalate once Boyce uncovers the dastardly work going on in the church’s crypt. Those nasty Nazis have created a chamber of horrors while attempting to create the 1,000-year soldier in service to the 1,000-year Reich. What started out as a mission to take down the tower grows in complexity — adding on the destruction of the evil laboratory and also the rescue of Chloe’s little brother, Paul, who was taken captive by the perfectly dastardly Nazi Wafner (Pilou Asbaek, Ghost in the Shell). It all culminates in an explosive climax that’s satisfying in its doses of horror. And it slickly ends with the tease of a possible sequel, one in which the target might very well be Adolf Hitler himself. That’s perfectly in keeping with this movie’s off-kilter, semi-Tarantino take on war as Hell.